In the pathbreaking essays collected here, Neumann and Kirchheimer demonstrate that the death of democracy and the rise of fascism during the first half of the twentieth century suggest crucial lessons for contemporary political and legal scholars. The volume includes writings on constitutionalism, political freedom, Nazism, sovereignty, and both Nazi and liberal law. 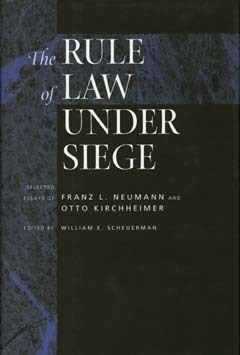 Most important, the Frankfurt authors point to the continuing efficacy of the rule of law as an instrument for regulating and restraining state authority, as well as ominous evidence of the rule of law's fragility in modern liberal democracy. William E. Scheuerman is Assistant Professor of Political Science at the University of Pittsburgh. He is author of Between the Norm and Exception: The Frankfurt School and the Rule of Law (1994). Franz L. Neumann (1900–1954) was a labor lawyer and legal advisor to the German Social Democratic Party before emigrating to England and then the United States after Hitler's rise to power. He was Professor of Public Law at Columbia University at the time of his death. Otto Kirchheimer (1905–1965) was a lawyer and left-wing Social Democrat who defended Weimar Democracy during its waning hours. He fled to France and then the United States, where he taught at Wellesley, the New School, and Columbia University.